Isolated rains in Tamil Nadu continued yesterday as well with many places in Cuddalore, Dindigul, Madurai & Virudhunagar districts enjoying moderate rains. Among the noteworthy mentions have to be Lalpet, close to Veeranam lake, in Cuddalore district recorded 43 mm while the agro weather station in neighbouring Kattumannar Koil recorded about 17 mm. Similarly the Tamil Nadu Agro University Weather station at Kurinjipadi recorded about 33 mm rains. Similarly the city observatory in Madurai to recorded about 18 mm rains while the airport observatory was fairly dry. Not very far away from Chennai in the neighbouring Chittoor district of Andhra Pradesh places like Nagalapuram, Satyavedu recorded moderate rains thanks to a localized development under the influence of the Eastern Ghats in the area. Today also we are likely to see some isolated spell of rains in Tamil Nadu. The areas in the Northwest Interior region of the state is better placed along with the adjoining areas of Rayalaseema and South Interior Karnataka. There is a weak wind confluence zone at an altitude of 0.9 kms around this region which could possibly be the trigger for the rains in this region. One cannot ignore the role of the Eastern Ghats mountains as well in providing the lift as well. As has been the case the areas close to the Western Ghats in South Tamil Nadu are once again placed well in what could be the last day of defining rains for Tamil Nadu as the next couple of days will possibly see the rain bands move slightly to the west and into South Interior Karnataka and Kerala. 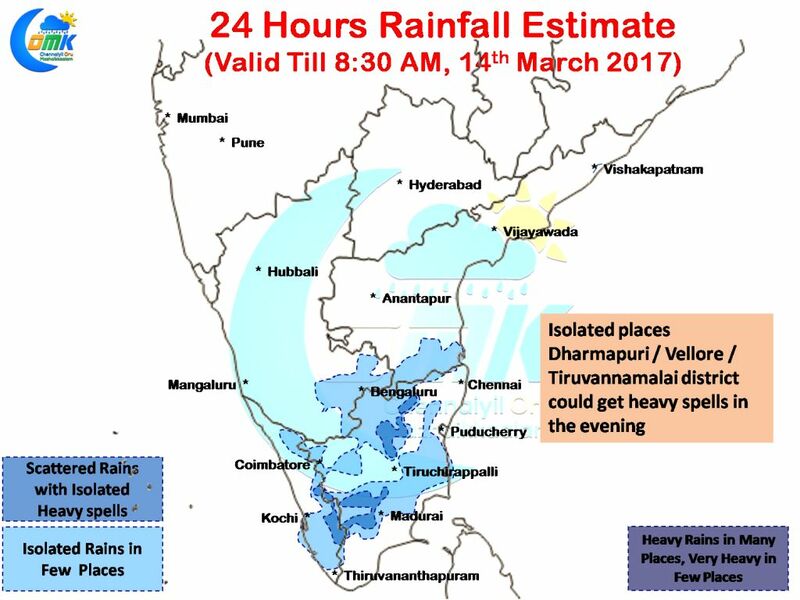 Subsequently the rains are expected to fade away from possibly 16th / 17th March.